Brookings SD – Mark Patrick Stop Smoking Seminar With Hypnosis – Thursday, April 4th (LM) REGISTER NOW! - Please arrive 30 minutes early to check-in. For One Day Only, Mark Patrick Seminars Will Be Coming To Brookings SD. …That’s Right. Mark Patrick Seminars is coming to Brookings on Thursday, April 4th. Join the nearly 50,000 clients we see every year and attend this life changing program! …Because no matter how many times you have tried in the past to stop smoking, THIS PROGRAM IS DESIGNED TO HELP YOU ELIMINATE YOUR DESIRE TO SMOKE without willpower…without cravings…without irritability…without weight gain…or your money back. "I Have Never Smoked Another Cigarette!" My friend told me about Mark's programs. I decided to try it them. I started on November 17 2006 and from that day I have never smoked another cigarette. I owe my life to Mark. I could not have done it with out him and his help." 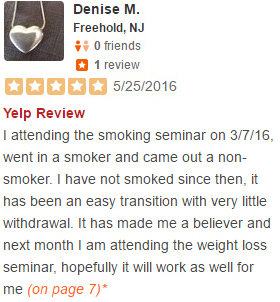 "I Stopped Smoking and Lost 60 lbs." "I found the seminar to be extremely beneficial!" A friend and I recently attended a MP Seminar for the smoking portion. I found the seminar to be extremely beneficial! The speaker triggered a part of my mind that had been asleep for quite some time. In addition, he impressively educated us with facts associated with smoking, eating, how our mind views these items. ......and how we can, if one is willing to open and work with their subconscious and submissive conscious mind, has the power and ability to change, alter or reset the way our minds work and we think. "Hasn't smoked in 4 months"
"I Have Not Had Any Desire To Smoke!" "I have been smoking since I was 13 now 43. I did the program I have not had any desire to smoke. Thank you for helping me out." 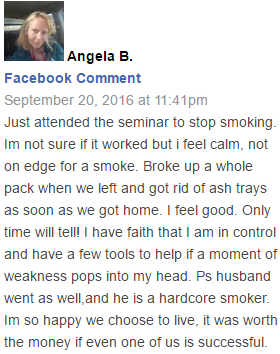 "It's been a few months I am completely smoke-free now"
I went to the seminar a few months ago with some coworkers from Work who needed to stop smoking. I am trying a whole lot of things in the past to stop smoking and they would work for a few weeks and then stop. I have spent a lot of money on prescription drugs gums nicotine patches etc. i even tried acupuncture. My stop smoking goal was not only to improve my health so that every time I run upstairs I am not out of breath. It's hard to keep up with my kids when you have to stop every so often. Anyways it's been a few months I am completely smoke-free now. "Over 1 Year Already As Non Smoker!" "I am amazed and so very thankful! It works, it really works!!!!" Hi mark. .. I just wanted to say Im a non smoker. After 50 plus yrs of smoking 2 plus packs a day I am a non smoker. You did it for me and it was so easy.i have no urges. I've gained 5 lbs but I don't care. I feel GREAT. I can breath again and food tastes so much better. 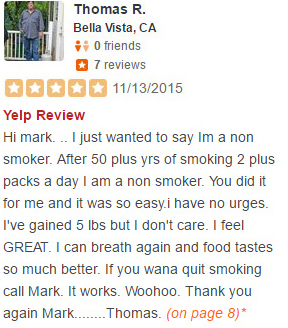 If you wana quit smoking call Mark. It works. Woohoo. Thank you again Mark........Thomas. "My husband & I both did the program four months ago. We haven’t smoked at all. I have no desire to smoke. We have recommended this program to everyone we know who smokes. This program is the best thing that happened to us." - Tommi & Andrew E., Pillow PA.
"What I Lost Was A Bad Habit!" I want to thank Mark Patrick and his employees for an incredible job! I went to the "Stop Smoking" seminar (my 1st seminar) on November 10th, 2015. I was alittle skeptical I will admit. Well, if you had told me that after 40+ years I could stop smoking just like that, I would have never believed you. On that date, I threw away a pack of cigarettes and haven't had one since. I am amazed and so very thankful! It works, it really works!!!! I was so impressed, I just recently went to the "Weight Loss" seminar, I will keep you posted as to my progress. Thanks again if has been a wonderful experience! "I Stopped Smoking after 30 years"
"Stopped smoking after 29 years"
Thank you Mark Patrick after 29 years of smoking 2-3 packs I have not smoked since Jan.14 2015. All of my family and my co-workers can't believe that I don't smoke anymore.I was able to control the few urges that I had and I listened to the CD every night. Most important I did not smoke on the way home. Thanks again. 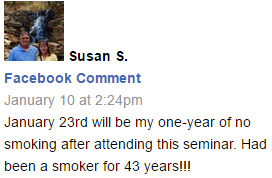 "Stopped Smoking After 43 Years!!!"